Quick change beads enable you to change your hooklength instantly and also act as a shock bead when fishing a running feeder. Simple to use and totally reliable they are perfect for stillwater and river styles of feeder and bomb fishing. Being from the old school of fishing, I very rarely used to use little gadgets like the Korum Quick Change Beads...in fact I very rarely used to use hooklengths at all. All that has changed nowadays, not only as we become more aware of fish care in general and constantly stive for things that make our lives, and our fishing that little bit easier. The Korum Quick Change Bead is one such device. Although it at first appears quite fiddly to use, this is not the case at all. Simply tie your main line to one end of the insert, hook your hooklength over the other end and push the whole thing into the bead casing. If you need to change your hook length for any reason, pull out the insert, remove the old hooklength and replace with another. Everything the manufacturers claim about this ingenious device is true. They are simple to use and totally reliable (they’ve been thoroughly tested in extreme conditions and will never let you down). I fished with them for a day at a commercial fishery and cuaght carp to over 10lb with no problems at all. Retailing at around £1.99 for five, they won't break the bank either. 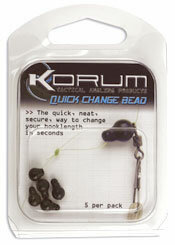 Korum Quick Change Beads are available from a wide range of fishing tackle outlets although UK Fisherman recommends you buy yours from Eccleston Angling Centre. Many thanks to Bun and all at Eccleston Angling Centre for supplying the Korum Beads for review.